When I was given the opportunity to review Herbivoracious, by Michael Natkin, I knew it would be perfect for the nine days. Remember how I said I can’t eat meat all week? Well what better time to review a vegetarian cookbook? None, I say. 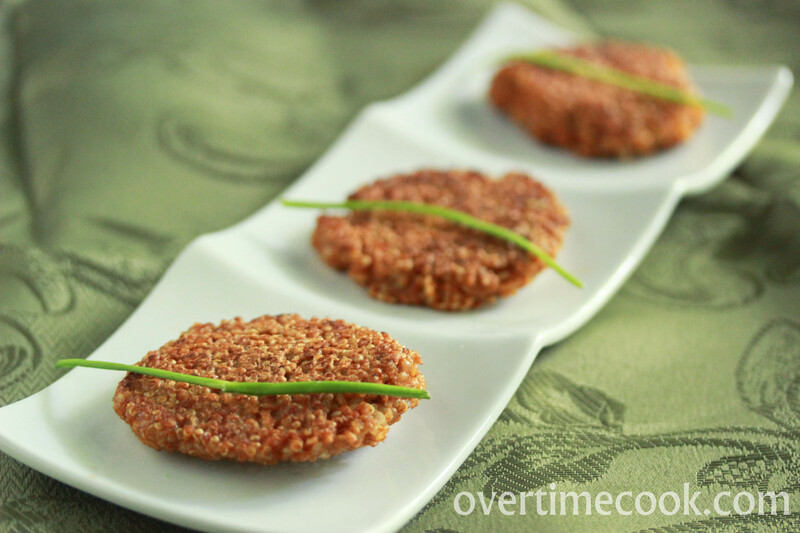 I loved these quinoa cakes, and enjoyed this cookbook! There is such a wide variety of recipes in here, you wouldn’t imagine that this book is vegetarian. The pictures are beautiful and eye-catching, and best of all, inviting. You would think that there wouldn’t be a wide variety of sections in a vegetarian cookbook (no meat, poultry and fish sections) but the cookbook was very cleverly organized. Main course recipes are divided into Sandwiches, pasta and noodle dishes, dishes from the stovetop and dishes from the oven. There is also a section of sauces, condiments and basic recipes which looks really interesting and useful. As a kosher cook, I love that the recipes (while not specifically kosher) are inherently kosher, and don’t require substitutions. Also, I’m quite conservative in the palate department, and this cookbooks make me want to try new flavors and ingredients. This isn’t a feature that I need, but for those who are interested, this cookbook features a lot of vegan recipes, and vegan options for some of the others. Spicy Corn and Potato Stew: this looks so filling and hearty- vegetarian comfort food?! Risotto Balls: most recipes for these incorporate both meat and cheese, which as a kosher cook won’t work for me. I’ve been thinking of adapting one, but now I don’t have to adapt! Sichuan Fried Green Beans and Tofu: I’m not a huge tofu fan, but this sounds delicious enough to make me enjoy tofu! 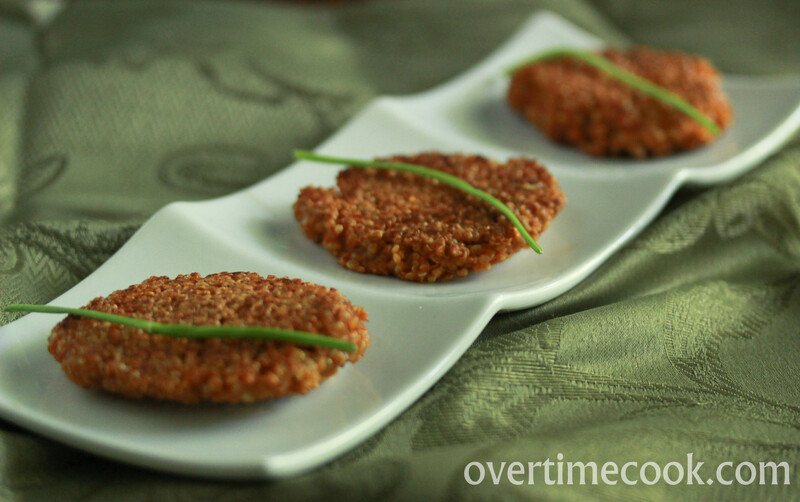 Chickpea Fritters: I love chickpeas and will always try another way of cooking them. This book is great for anyone who is a vegetarian, or wants to cut some or all meat out of their diet. Additionally, this cookbook is good for people who want to learn to cook new flavors and ingredients, that just happen to be vegetarian. This cookbook, at the end of the day, is a vegetarian cookbook, and you have to be interested in that to enjoy it. Additionally, as I’ve mentioned, this cookbook has a lot of different and unusual ingredients. If you aren’t looking to expand your palate, this book isn’t for you. I’m always looking for healthy recipes and ideas for healthy cooking, so I appreciate this book, but ultimately I am a chicken eater, and definitely can’t imagine going vegetarian. This won’t be my go-to cookbook, but one I’ll use for something different and possibly healthier. My main issue with this cookbook is both a pro and a con. There are a lot of recipes that call for ingredients that I’ve never heard of, and never seen (or perhaps noticed) in my local grocery store. I’m open to new things, but this book has a lot of new things. This is a gorgeous cookbook with a lot of innovative recipes. It’s an excellent choice for people who are looking (or even willing) to cut meat out of their diets, as well as try new ingredients and flavors. Disclaimer: I was provided a review copy of this cookbook by Harvard Common Press. Opinions are my own. Rinse the quinoa twice in cold water, then place in a pot. Add two cups of water and bring to a boil. Reduce the flame and leave the quinoa to simmer until the water has all been absorbed, about 15-18 minutes. Remove quinoa from the pot and place in the fridge to cool. Heat a frying pan over medium heat and add a small amount of oil. In a small bowl, combine the cooked quinoa, the spices and the eggs and stir to combine. It should form a slightly thick texture. Form a small ball of the mixture and place it in the pan. Press down slightly with a spatula to form a patty. Fry for 2-3 minutes until golden. Flip the patty and fry on the other side until golden. Remove from pan and serve hot. Do you go out and BUY all the dishes, bowls, etc. that you use to present your delicacies with? Do you borrow? Funny you mention this on this particular picture, because I’ve used this particular plate in at least two other posts, probably more. I do buy a lot of props for my photography. Most of them are bought for my magazine pictures and then used for the blog. I get them at discount stores like Christmas Tree Shoppe, Marshall’s, etc. Your photos are really inspiring me to take myself out to buy some more and better props for my food-tography because even just this dish towel and out of the ordinary but simple plate really make the photo eye catching. 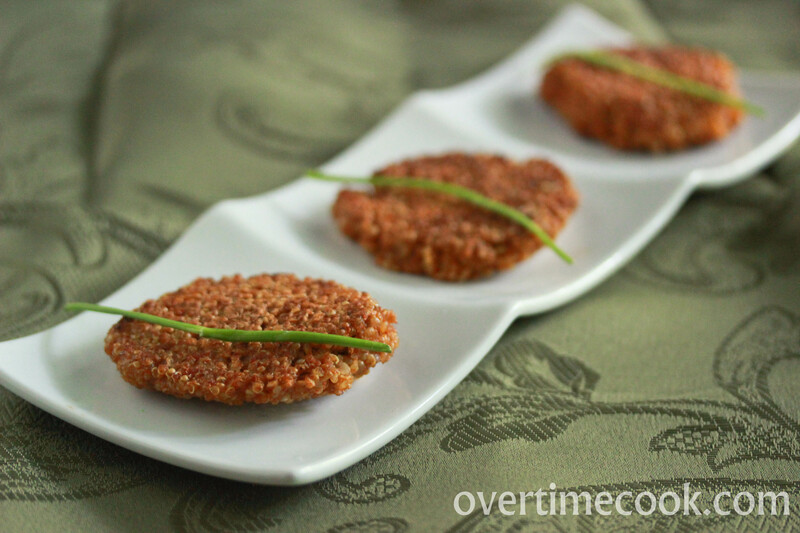 Lovely presentation of the quinoa cakes and another wonderful cookbook review. I’m a chicken eater too but I’m sure some of the recipes in this book would interest me! Thanks Paula, the book has a bunch of really interesting things. These look fantastic! I need to get buy hands on that cookbook! Hindy, that book is right up your alley! Ditto to G6- where can I get all those pretty plates?!? Thanks Christina, they sure are. Looks so good. What would you recommend to go with this for a meal?? Stay tuned! My next post is going to be featuring these in a delicious meal! Can’t wait to get my hands on this book. Thanks for the great review! These look so elegant and tasty, too. Looks like a great “finger” food to put out at a party or something! Made these for Shabbos. They are delicious!! I love this recipe idea- every time I serve quinoa to my kids it lands up all over the kitchen and is almost impossible to clean! This recipe keeps it together in a kid friendly finger food. Thanks for sharing! This recipe looks great!!!! Any suggestions how to bake these cakes as oppose to frying!! Thanks!! Love your recipes!!! I wanted to share that when I make Quinoa patties I also add some shredded veg like carrots (not sure if you’re a fan ;)) and a bit of turmeric. My kids love them too! Thanks for sharing your wonderful recipes and putting in time and effort! You work so hard!! Would you recommend eating plain or using a dipping sauce? Try it with some spicy mayo! Yum.